Manchester Sleigh Flotation Bed Group with Fast Free Shipping! 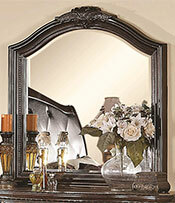 Traditional European design with ornate upholstered, tufted headboard with wood carved details. 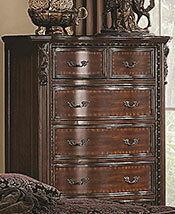 Antique finish with hand applied details. The flotation system includes: bed, mattress, and foundation. Matching furniture available. Traditional European design. Ornate leatherette upholstered and tufted headboard with wood carved details. Serpentine curved fronts. Antique finish with hand applied details. Available in Queen, King and California King sizes. The Manchester Upholstered Flotation System includes: Bed with Headboard Sideboards, & Footboard, 8" deep plush-top soft side mattress and matching foundation for a complete modern flotation system. Available in Queen, California King and King sizes. The Manchester Sleigh Flotation System Includes: headboard, footboard, side rails, center support, premium full depth 8" mattress and foundation for a complete flotation system. 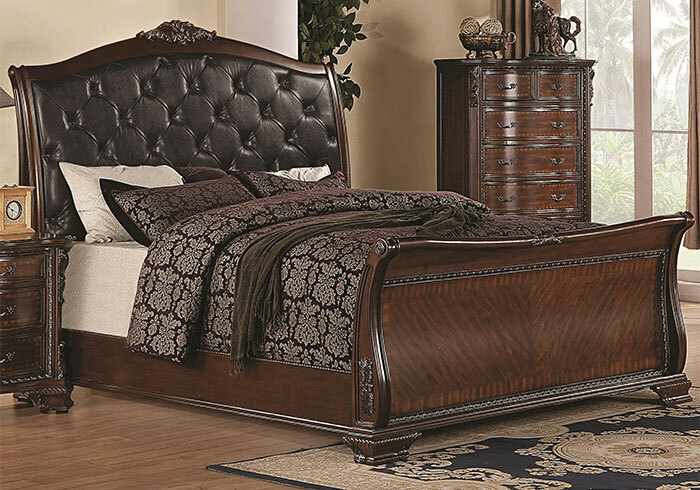 The Manchester Sleigh Flotation Bed Includes: headboard, footboard, side rails, center support. (Does not include mattress). The Manchester 9 Drawer Dresser. 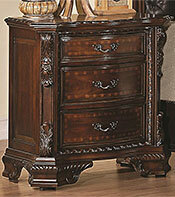 Traditional European design with carved details, felt lined top drawers and serpentine curved front. Width: 68 x Depth: 22 x Height: 38.